Unseen Films: Two takes on One Cut of the Dead (2018) which is playing at the What The Fest? Two takes on One Cut of the Dead (2018) which is playing at the What The Fest? It takes a little time to figure out exactly what’s going on in Shin'ichirô Ueda’s ONE CUT OF THE DEAD. But as the film barrels on, the bits and pieces click into place and one can’t help but smile at Ueda’s cleverness and the sheer complexity of his undertaking. This is a film that works best when audiences go into it completely cold with no preconceptions. But since the phrase “Please go see this movie” is about 395 words short of my minimum for reviews, I’ll have to let part of the cat out of the bag. But only a small part. The first thirty minutes are presented as a found footage movie about a film crew shooting a cheesy zombie film at an abandoned factory when—surprise!—real zombies attack. Filmed in one long take with a handheld camera, it’s awkwardly paced, irregularly acted, and most crucially, not scary. The whole things reeks of unintentional camp, from a middle-aged make-up artist demonstrating women’s self-defense techniques straight out of Diedrich Bader’s karate class in Napoleon Dynamite to a twist revealing the director went insane a long time ago and deliberately led the film crew to the zombie-infested site so he could film their “real fear.” (This director is responsible for the single genuinely entertaining part of the documentary when he suddenly reappears after seemingly being bludgeoned to death, throwing open one of the side doors of the car the surviving actors are trying to escape in, pushing a zombie into it, and maniacally screaming “Action!”) It finally ends with an amateurish climax where the Last Girl—an actress who’d been berated by the insane director for blowing takes with her mediocre acting skills—confronts her freshly zombified co-star and behind-the-scenes love interest with an axe. She raises it, begs him to come around, steels herself, and pauses as if she forgot her line or that she’s on a roof being attacked by a zombie. She raises it a second time. Again she chokes. A third time, and she finally manages to chop his head off. With the zombies defeated, the camera pulls back into the sky for a bird’s-eye view revealing she’s standing in a giant pentagram of blood. And then the film abruptly jumps a month into the past where we watch the producers, director, film crew, and cast get together to plan the fateful zombie shoot we just watched. I refuse to spoil what happens next, but please believe me when I say that it’s nothing you might expect. 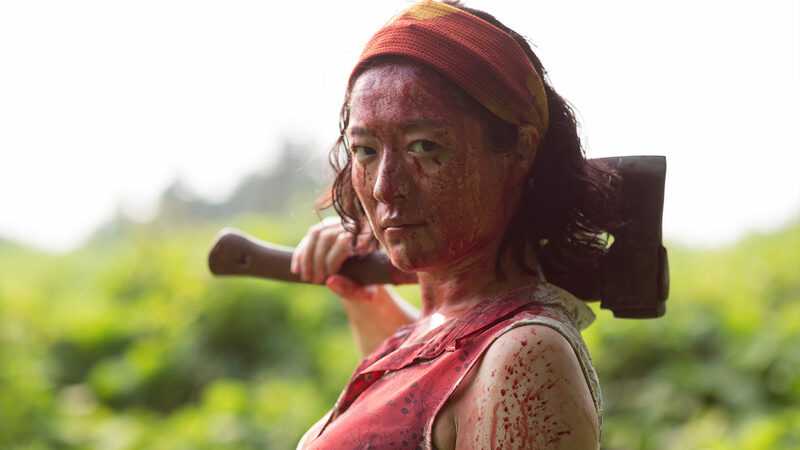 One Cut of the Dead represents everything great about the New York Asian Film Festival: a celebration of bold new talents, unexpected genre mashing, and audacious filmmaking that leaves your mouth on the floor. It was supposed to be the Rope of zombie movies, filmed in one continuous shot. Then the zombies attack for real. However, if you think that sounds crazy, wait until you see it all again from a different perspective. Zombies get the mash-up treatment like never before in Shinichiro Ueda’s One Cut of the Dead (trailer here), which screens during the What The Fest.